Best Western Rogerthorpe Manor01977 643 839work HotelBest Western Plus Rogerthorpe Manor Country House Hotel is located in the idyllic village of Badsworth, near Pontefract West Yorkshire. Set in glorious countryside, yet only minutes from the A1/M62 road links, this impressive Grade II Manor has been restored to a 27-bedroom Hotel. We have very impressive and stunningly stylish Suites @ The Manor. These 5 barns have been lovingly converted into modern and unique bedrooms, with their very own private parking spaces. All the suites are fully equipped with kingsize memory foam mattresses, 55” TVs, high-speed complimentary WI-FI, power showers and/or baths - including luxury bathroom products - and loan of bathrobes and slippers. Suite 19 has its very own dancefloor! This suite is perfect to spend the evening on one of the hotels fabulous Pyjama Pamper Party packages. Relax and unwind in your very own suite with your party of guests and indulge in some you-time and relaxation with our dedicated beauty therapist, along with Prosecco, strawberries and canapes to nibble on and a few extra little treats! Or why not treat your loved one to a romantic overnight stay, with a three course meal, a bottle of Prosecco on arrival with Chocolate truffles and a massage each, all in the comfort of your own room for the weekend. The hotel boasts two large banqueting suites, syndicate rooms and our Oak and Rose Rooms which can accommodate a more intimate gathering. This is the perfect venue for meetings and conferences, events, Christenings, Christmas Parties, birthday celebrations and anniversarie,s to name a few. With Gold-award-winning gardens and a beautiful outdoor wedding folly, Rogerthorpe Manor is the perfect venue for your big day! The Jacobean Pub offers a great atmosphere for all the family, with a wide variety of ales and traditional pub food, our very popular theme nights and special menus served throughout the year. We have a Sunday Carvery for just £10 per person with guests traveling far and wide to sample our great British Sunday Roast. If you require any further details please contact our dedicated team on 01977 643839. 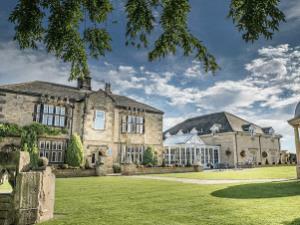 Best Western Plus Rogerthorpe Manor Country House Hotel is located in the idyllic village of Badsworth, near Pontefract West Yorkshire. Leave M62 at jct 32 to Pontefract, A639 to Doncaster. Take bus from Pontefract to Upton/South Elmsall. Bus stop opposite hotel at Thorpe Gate, Badsworth.